Home/Cloud Native/AI & ML in Business: Master Problem Solvers? Have a tricky business problem? Chances are Machine Learning and Artificial Intelligence can help you solve it. However, it’s not a one-size-fits-all solution – Artificial Intelligence (AI) & Machine Learning (ML) can do a lot, so there are a few things you need to know, not least of all the difference between the two. Secondly, once you know this, you can then look at what you want to optimise or improve in your company to determine the most suitable technology. Here, I want to explain the key differences, before discussing some of the surrounding technology and the most applicable AI and Machine Learning use cases for business. The terms “AI” and “ML” are sometimes confusing and often used in the wrong context. What exactly is the former and how does it differ from the latter? So, let’s start from the outer layer – what is AI? In the simplest terms, it can be understood as anything that can mimic human-like behaviour. This is a general and capacious definition but it nonetheless reflects the reality quite well. There are hundreds of examples of AI in action already – in fact, AI is everywhere and everyone already uses it, sometimes even unwittingly. For instance, you use AI when you unlock your phone with facial recognition, when you speak to your voice assistant, or when you navigate your favourite streaming platform. Of course, AI also exists in much more sophisticated solutions, such as self-driving cars or eerily human-like AI-powered news anchors (more on that below). Nowadays, it is more or less everywhere, implemented in many different forms. ML, on the other hand, is a field of knowledge which allows for the implementation of certain AI scenarios. For example, ML can be used to develop learning models that will boost your AI usage. It is, in its deepest sense, a set of algorithms or methods of various origins. Of course, this is still a strong simplification idea as, in essence, “Machine Learning” is a concept, not any specific algorithm. However, in the previous graphic, you may have noticed another, smaller layer within. 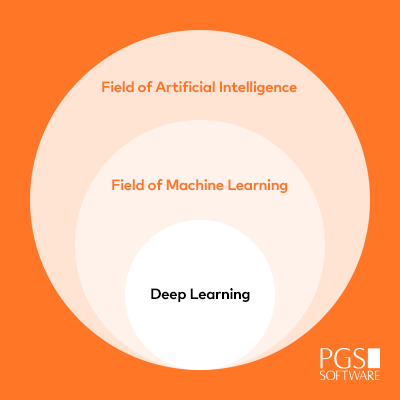 This is because there’s another term often mentioned when speaking about ML, namely deep learning, which is sometimes also referred to as deep neural networks. Deep Learning (DL) is one of ML’s methods. It is very sophisticated in its mathematical nature and is used for specific scenarios. However, there are many other simpler ML methods, which are strictly analytical and, even if they generate “smart” results, they are based on mathematical calculations (such as linear regression). That said, we must emphasise one rule, which is the most important of all: there is no ML without data. Today’s world and technology provide a lot of data that can be used to train our ML models. More information allows for more accurate results, which is why machine learning is often paired with Big Data processes. This fact is exploited by many companies, especially Cloud providers, which provide us with ready-to-use AI solutions. These services have been taught and trained using ML methods and can now be used by anyone by means of simply using the application programming interface (API). The benefits of using the Cloud for AI and ML purposes cannot be overstated. First of all, as previously stated, you can use ready-to-use APIs, fed with data already gathered by Cloud providers. Consider, for instance, image recognition – such models are based on the billions of images stored and tagged in the likes of Google’s indexation. You can’t create a better model if you don’t have a sufficient number of assets to feed your learning process – and there’s a very, very high likelihood that you don’t have a larger dataset at your disposal. What’s more, you can begin making use of Cloud resources at a low-cost and stop using them right after your algorithms finish their work. Thus, you don’t have to provision huge servers and can avoid overpaying for required resources. With the Cloud, you only pay for what you really need and actually use. This also makes it highly scalable, giving you more processing power or server space as you refine and expand your AI & Machine Learning applications – rather than having to prepare ahead with physical hardware of your own (arguably one of the strongest limitations for these business applications in the past). If possible, everyone would rather be sure of their solution’s market maturity before its official live launch. Within AI/ML projects, you’ll be able to test, iterate, and fail fast safely and cost-effectively. It’s always better to smooth out your solution’s edges in a low-risk, userless environment. This way, you’ll be able to save your consumers unnecessary frustration, providing them with a sophisticated and polished final product instead. The whole point of artificially intelligent solutions lies in allowing them to continuously improve. To do so, they need to have feedback loops, which pinpoint the occurrence of “bad” decisions. This is a necessary step to be able to stop repeating them. As the philosopher George Santayana once said, “those who do not learn history are doomed to repeat it” – a sentiment that applies to people, businesses and artificial intelligences alike. In the future, such knowledge will aid you in making smarter business decisions. However, it’s important to note that you should experiment with AI in areas that won’t jeopardise your organisation’s good name or high quality user experience. You’ll only be able to unearth AI’s true potential if you use it to solve the right kind of business problems. With such exciting technology, it’s easy to get caught up in its seemingly boundless world-saving capabilities and risk losing your focus towards solving real issues that, when answered, will noticeably help improve your company. However, it’s important to remember that one should first learn to walk before signing up for a marathon. Breaking your AI efforts into smaller (yet nonetheless important) projects helps to focus your teams’ energy, allowing them to deliver cutting-edge solutions more efficiently. Hard logical rules are not the way to solve real world problems yet, unsurprisingly, these are the issues we’d like to alleviate the most. Machine Learning is situational in nature. It understands exception and emotion. It learns from examples, meaning that instead of writing thousands of lines of code, a machine can learn from observation, so that it’ll later be able to apply that knowledge on its own. This isn’t magic; it’s ML with a dash of data science. Companies today are making use of Machine Learning to collect valuable and, perhaps more importantly, actionable Business Intelligence and predictive analytical insights from large amounts of data – both those collected historically and in real-time. This is because there is tangible value in basing your business strategy on hard facts, as well as on mistakes that your machines have made and, consequently, learnt from. ML algorithms create repeatable, reliable, and executable business processes. They identify correlations, make recommendations, and personalise user experiences through understanding context. Considering all this, it’s easy to understand why so many businesses today are choosing to employ Machine Learning within their solutions, all in hopes of increasing profits and driving innovation. It’s not just about the algorithms, though. Digital Transformation innovators need to envision the bigger picture to ensure that data, logistics, user engagement, etc., are all taken into consideration to help reach optimal effectiveness for the organisation as a whole. Below are a few examples of Machine Learning pairings which have been known to generate the most impressive results and technological advancements. If you’re looking for a solution that touches on any of these areas, turn to ML to help you catapult your concept to greater heights. Machine Learning and smart data analytics, when combined with a cutting-edge Business Intelligence (BI) platform, can lead to a greater operating efficiency and more effective problem identification. The combination of Machine Learning and Business Intelligence is especially useful where immediate information can drive valuable decisions and problems need to be identified in real-time. This particularly applies to e-commerce and banking (specifically, fraud detection – but more on that shortly) as, with these, action needs to be taken in a timely, accurate manner. More specifically, a well-informed application, empowered by machine learning, can identify unique trends and react faster than a human can. One of our clients, a media company which publishes hundreds of articles on a daily basis, had a low-efficiency editorial workflow. Journalists were spending too much valuable time searching for, sorting through, and categorising article images – instead of being able to focus on writing. Fed up with wasting resources, they approached us with an idea that involved prototyping a smart Cloud-hosted Machine Learning solution, which would automatically process, tag, and sort images. The created prototype showed the company that the Machine Learning image recognition and classification approach helped to solve their workflow problem and accelerated the entire process – freeing up resources and saving time. In November 2018, China’s state agency, (Xinhua), debuted the world’s first AI news anchors. The broadcasters were developed using Machine Learning, thanks to which they are able to simulate the voice, facial expressions, and unique gestures of real-life news presenters, as well as both generate and present new information to viewers. Such stunning advancements have recently been made possible as ML technology began to approach sound from a visual perspective. This latest development rendered image recognition a key facet of AI research because, even where the material to be processed is sound-based (or otherwise abstract and non-visual), the most measurable data is still presented graphically. The nature of fraud detection and prevention provides ideal ML and AI use cases in banking, as well as other applications in the wider financial sector. Most consumers don’t even realise that there are complex, intelligent algorithms behind financial services’ customer care endeavours. Tired of having to validate every transaction with an SMS-generated passcode? Next time you’re asked to do this, just remember that you’re helping your bank’s implemented ML technology to learn and, hence, prevent fraud in the future. So, you can thank those algorithms later. Machine Learning in finance services allows data scientists to easily and accurately determine which transactions are most likely to be fraudulent. That’s because it enables patterns to be automatically discovered based on large volumes of data collected from live transactions. Skilfully employed ML solutions can effortlessly differentiate between fraudulent and legitimate activity, while also learning to identify previously unseen fraud tactics. What’s more, once such trends have been identified, ML can use this knowledge to stop repeat events in action. Ever had your bank notify you of possible fraudulent activity that they managed to stop before it went through – not after? You also have ML to thank for that. However, it’s important to make use of an expertly crafted ML model to ensure that it will be able to correctly perform thousands of computations in milliseconds. ‘Correctly’ being the crucial word here, as algorithms can just as easily learn the wrong things, resulting in complete ineffectiveness. Human oversight should always be regularly deployed to check and steer ML on the right path. The prognosis for the next decade clearly points to Big Data becoming an ubiquitous staple in everyone’s lives. Last year’s American Big Data conference, BigData SV 2018, presented research findings indicating that Big Data will generate about $103 billion by 2027. The revenue brought in by this tech sector will grow at a rate of about $10 billion a year. That’s impressive! But this also means masterfully crafted AI and ML will continue to grow in significance. In fact, they’ll likely become necessary, as Big Data solutions quite often lead to resolving predictions or classification problems. And, as previously mentioned, ML just isn’t possible without data – therefore, Big Data is a necessary component for AI. It seems then that all things data will take reign in the foreseeable tech landscape – making AI and ML the key advisors with a guaranteed a seat at the table. In summary, if you’re looking to throw in a bit of innovation into what you’ve been doing or to completely digitally transform your business – look to ML, AI and Big Data to see how you can make the best of what’s to come. Artificial Intelligence and Machine Learning can help businesses to make the most of any and all available information, refining solutions, and instigating continuous improvement. While it may seem daunting, the agility and scalability of the Cloud, and the support offered by these providers, is making AI & ML increasingly available for businesses of any size. Solution Architect for PGS Software with a special focus on the Cloud, particularly in AWS and GCP. personal interests include DevOps best practices and Machine Learning.